Do you ever wish you could teleport from one place to the other without having to walk, drive, or do any kind movement at all? While the idea seems great to just deconstruct and reconstruct ourselves from one space to another, we would have to deal with a bunch of issues like wondering if we died after each transportation, making ourselves an entirely new entity. If you’d rather bypass all the nitty-gritty of that sort of talk, why not use a zip line? Sure it will be a bit more work to set up a zip line from your apartment to the office or grocery store, but it is entirely possible. Whether or not it’s legal is not really an issue of my concern, but hey, it’s your life. 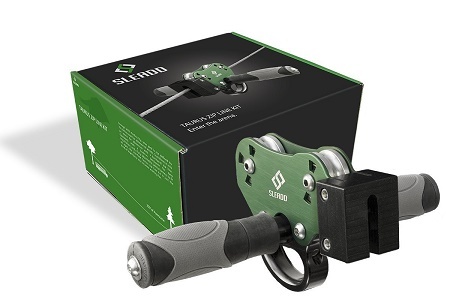 This Sleadd Taurus Zip Line Kit will help you to work out those transportation issues with ease, as it will give you 260 feet of 5/16” galvanized aircraft cable to travel wherever you may need to. Of course, it’s really just a one way trip that doesn’t take you very far at all, but it’s fun to think about getting everywhere via zip line. The trolley is built with green anodized aluminum sideplates, rubber grips, and stainless dual ball-bearing wheels with a front bumper. The riding gear has a carabiner, 18” lanyard, and adjustable harness, which you will hopefully be wearing every time you use this thing. Grips and cable clamps will secure this around trees that are up to 3 feet wide, and installation should take about 30 minutes. This recreational kit is going to cost you around $780 with shipping, and will sadly not help you with traveling anywhere outside of a quick thrill ride from one side of the yard to the other.